Central Bank of India Recruitment 2017 had invited application for a Central Bank Job Recruitment Vacancy in its latest advertisement job notification for the post of Director for RSETI to apply by Candidate on early base. This is hiring for central bank job recruitment to recruit any Graduate or Post Graduate candidate to apply a Director for RSETI post open this job possibly within two days. 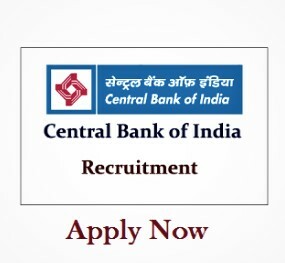 Applicants who cleared their Graduate or Post Graduate can do apply for this job recruitment offered by Central Bank of India. They want to recruit total 01 posts to fill the post of Director for RSETI, However, Graduate or Post Graduate can easy to apply before the last date reaches. If you are interested and Graduate or Post Graduate student then must have to apply before 05/07/2017. They want to collect job application to send through the Offline method only by all eligible candidates. Eligible students can accept to send and apply by offline for the Director for RSETI job post on or before 05/07/2017. Try to read each and all job information before applying to Director for RSETI job like post vacancy, salary, job process for selection, minimum qualifications, age limit, fees to pay if any, how to apply for this job and many other details to read. Check details properly and then only apply for this job opportunity provided by Central Bank of India Recruitment 2017. We informed already that you can send your job application by offline method only. Job Address: Regional Manager, Central Bank of India, 601, Napier Town, Jabalpur (M.P.). Central Bank of India recruiting for the jobs posting of Director for RSETI job openings to fill their job vacancy in their Main Branch Office of Central Bank of India Recruitment 2017. So, Apply now to this latest job opportunity and fill total 01 job post vacancy to work as a Director for RSETI. Go through details below for more job information which is required to read before applying in Central Bank of India. Qualifications: (i) Graduate/Post Graduate Degree from any UGC recognised University, (ii) Officers with rural development background i.e. Agriculture Finance Officer/Rural Development Officer/Agriculture Officers converted to Mainstream of Banking/Lead District Managers and Faculty Leaders/Faculty members of Training Centers/Colleges with specialization in Rural Development etc. Shall be preferred. Age Limit: Less than 65 years with Sound Health. - Candidate should have retired on VRS or on attaining superannuation with minimum 20 years of service of which at least 15 years in Officer Cadre in Bank. - Eligible candidate should have worked as Branch Manager in any scale in a rural branch for at least 3 years. - Applicant should have an unblemished record and possess satisfactory service certificate from the previous employer. - Candidate should be well conversant with the local language. - The candidate should be resident of the same State, preferably same or nearby district. One year of a contractual base. Renewal may be possible at Bank’s sole discretion in terms of extant policies and rules. (i) For the selection in Central Bank of India, you have to apply before the last date which is 05/07/2017. (ii) Central Bank of India will be called to an eligible candidate for a personal interview for final selection. (iii) Only bank retired officers are eligible to apply. Applications of other than retired bank officers shall not be considered. How to Apply for Central Bank of India Recruitment 2017? Send your job application by Offline in the given form format. The last date to receive the job application is 05/07/2017. No applications will be received once last date finish. Incomplete details of candidates in applications will be not acceptable at any cost. Address to send the job application, by writing “Application for the post of Director for RSETI on contract base for the year 2017-18” to Chairman, Regional Manager, Central Bank of India, 601, Napier Town, Jabalpur (M.P.). As the last date to apply is 05/07/2017 so apply before for this job post of Director for RSETI. The important date to remember to apply for this job is 05/07/2017. Apply now in Central Bank of India Recruitment 2017 job post Vacancy for Graduate or Post Graduate holder candidate can able to apply for Director for RSETI before the last date. Check out for more jobs such as Fresher, Govt, Graduate, Post Graduate, latest, Jobs vacancies and do share with your Facebook and Twitter social friends those who like to work as a Director for RSETI in Central Bank of India 2017-18.